I must confess. I feel a little bad about my relationship with Lady Emily Ashton. I came across her adventures in the wake of LadyJulia Grey's escapades and I fear I won't be able to do Emily justice, that she will always be overshadowed by Julia. And, um, Brisbane. Do not mistake me. I like Colin Hargreaves very much. He is a delight and I hope Emily never throws him over. But he's not....well. He's not Brisbane. There. I've said it. We can move on. 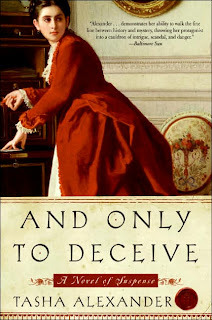 If you haven't guessed by now, And Only to Deceive is the first in Tasha Alexander's series of Victorian mysteries featuring Lady Emily Ashton. A series that has a fair bit in common with Deanna Raybourn's Julia Grey novels. Emily, like Julia, is made a young and rather sudden widow at the start of the story. The thing is, she never much cared for poor, dead Philip. He was simply a way of escaping her overbearing mother. To the cynical Emily, he represented the lesser of all the evils courting her. After his death, however, Emily is shocked to discover her husband was wildly, irrevocably in love with her and she had no idea. Through his journals, letters, and stories told by his closest friends, she comes to know and love her late husband. As she embarks on a study of ancient Greek language and sculpture (in memory of Philip who was something of an afficionado), Emily becomes involved in a ring of forgeries leading back to Philip and his friends. It seems she has a few more things left to learn about the man she married. The best thing about And Only to Deceive is the wonderful immersion in all things Greek. I was instantly taken back to my history of civ classes and what a wonderful experience I had reading The Iliad for the first time. Emily, too, had the good sense to prefer Hector to Achilles. I thoroughly enjoyed watching Emily fall in love with her husband and struggle with the fact of coming to know him secondhand and all too late. I loved the way she embraced the life of the scholar as a tribute to him and how she tried to move on despite the ever-constricting mourning requirements imposed on all sides. Unfortunately, her loyal love for her husband soon becomes a bit ridiculous as it is clear he is dead and was not, perhaps, the capital fellow his friends made him out to be. Emily also suffers a few TSTL moments with regards to the merits of her two suitors as well as her endeavors to unmask the villain. As a result, I grew a bit impatient on the whole. Not enough to deter me from the next installment, as I did enjoy many things about this light and charming mystery. Here's hoping things pick up a bit in the next one. Thanks for this review, Angie. After reading Silent in the Grave in 2007, I started searching for something similar and came across And Only to Deceive. One of the Amazon reviews stated it was no Silent in the Grave, so I decided not to read it because I knew I would only compare it to Deanna Raybourn. Your review confirmed that I'm still not ready to read it, but it sounds good enough that I will keep it on my list. Laura, yeah, I'd keep it on your list for after you've gotten some distance from the most wonderful Silent in the Grave. :) I'm into the second one and it's quite a bit better, IMO. So that's something.